We have a lot of books - many of which we haven't read. We collected a lot of pretty hard cover books for the wedding (we used them with our center pieces) and they have been sitting on our open shelving for the past 10 months. I figured it was time to either do something with them...or donate them. I decided I'd make a little hidden storage with a handful of them. [STEP 2] Next, you'll assemble your spines. Figure out which books you're putting on either end and set them aside for later. 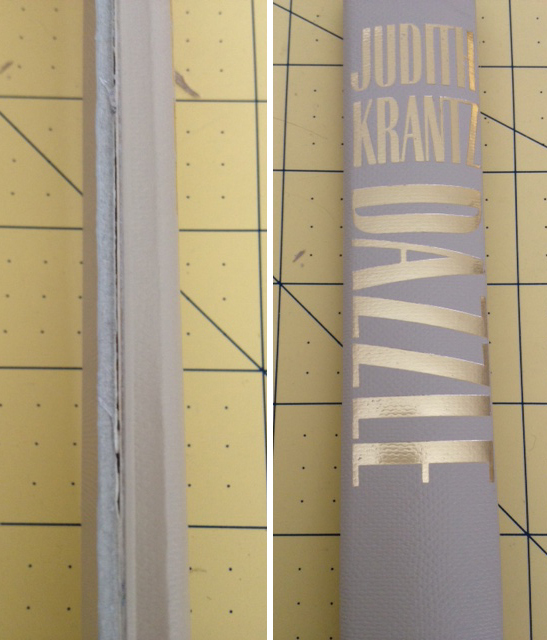 Take your first spine and cut off the front and back cover (leaving a little bit of one cover so it can be folded over and glued together). Repeat the above steps with your end books - except leave either the front or back cover to hide the side of your crate. Fold over and glue together. 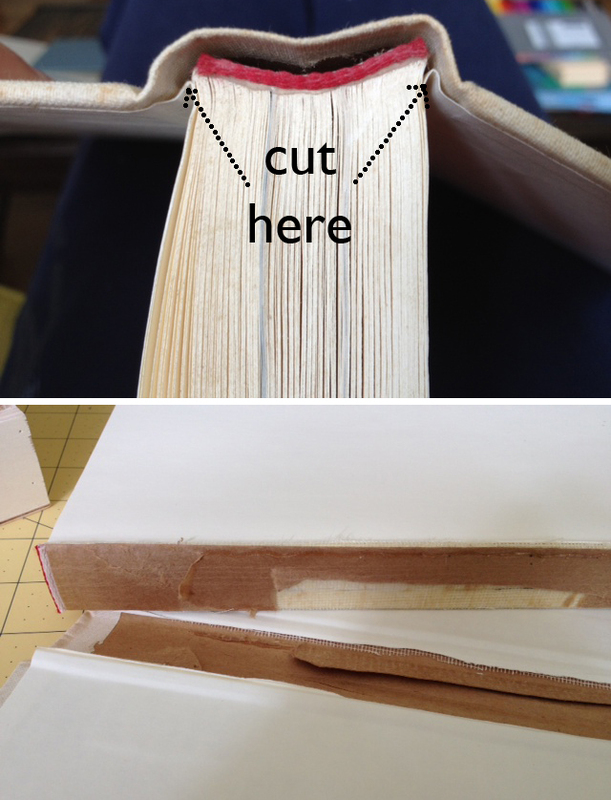 Glue your "books" to the crate. I didn't do a very good job of measuring, so I had to add some spacers between my book end and the crate. I used the left over book covers to fill the space and covered it so it wouldn't be seen. 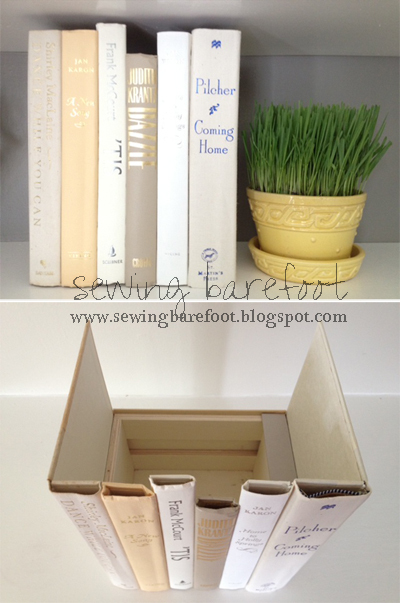 Now you have some "books" to add to your shelf that will serve as hidden storage! Thanks for the comment and the invite. I've added your link party to my list of weekly link ups :) Thanks! This is awesome!!!! I am visiting form the Catch a Glimpse link up and wanted to stop by and say hi. I a a new follower. I blog over at http://www.garagesalesrus.blogspot.com/ I hope you will stop by and do the same. I also have a giveaway with a Circut Machine going on right now. I would Love it if you entered but you have to hurry it ends tomorrow! Hope you have a great day! This is a fantastic idea! I am totally going to try it! Thanks for the inspiration I am your newest follower! If you ever have time I would love for you to come check out my blog! Thanks for following! I'll definitely head over and check out your blog. That is such a pretty and practical idea! How smart you are to figure out how to make it. What a wonderful idea! I'm sure I already have everything I need, which makes it my favorite kind of craft project! I'm your newest follower! My sister used books as centerpieces for her wedding as well and now has boxes of books all over her small apartment. I am definitely going to show her this post (and also snag a few books to make one for me!). Simple, cute and ingenious...great job! I like this idea! I will be making one soon! Can't hardly bear to destroy books, but I think I can finagle this with semi flattened paper towel rolls and some neat decoupaged paper or fabric and printed titles, maybe on tissue so it blends into the paper? On the other hand, I've done loads of projects with really old book pages which have beautifully gold hued edges. So, maybe I can destroy more books and not feel guilty. Gotta try this, thx for the creative kick start. Love the idea! Where did you find the wooden crate? I love this so much and I have a ton of books laying around waiting to be donated. Now I am going to do something cool with a bunch of them. I'm your newest follower. Hope you'll return the favor and follow my blog and/or FB fan page! hi i like your ideas...great and thnx!!! Great idea. The dilemma, what books do you want to be seen and if they make the cut you have to cut them up. That is genius! Loved it!! At first the bibliophile in me cried over these beautiful destroyed books! The horror!!! But I just realized that the book itself can still be read, it just won't have a cover! Phew!!! Now I just might have to try this!!!!! Great idea. We have a "free barn" here in town at the county dump and there are a ton of books that have been dropped off there that no one wants and the library has passed on, so I think I will go up there and find some nice covers, clean them up, and make some little storage boxes. My mind is just racing with ideas of what I can hide behind these "books"! Thanks for sharing! Love this idea. We have a "free barn" here at the county dump site that residents donate items they don't want anymore, but don't want to throw away. As you can imagine, there are a ton of books donated. I think I will go there, pick some nice covers, clean them up good, and then make some of these book storage units. My mind is racing with ideas of what I can hide behind them. I love the idea of not having a lot of "stuff" sitting out on book shelves, and just seeing "books". Thank you for sharing! Thanks for the clever tutorial! Do you have pics from the wedding center pieces you mentioned? Such a nice tutorial and very informative blog . Thanks for sharing . Awesome idea! Stupid question, but can the remote shoot through the book covers?